Coming up with new, delicious, and easy vegan and gluten-free desserts for Carroll Cafe is a challenge. This month I decided to give rice pudding a try. I figured there must be a good recipe using a non-dairy milk to make it vegan. While I usually prefer my rice to be savory, this rice pudding got rave reviews. 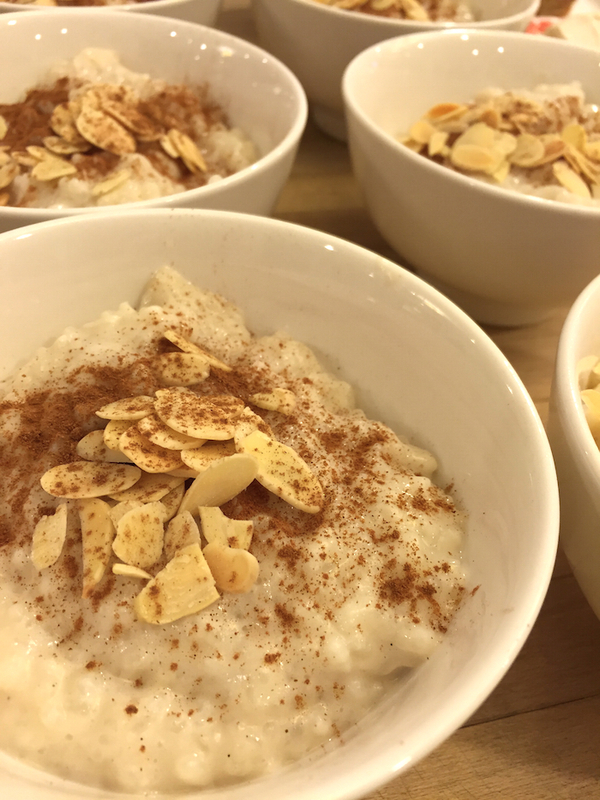 There are quite a few rice pudding lovers out there, and I’m pleased to say that this vegan, gluten-free version seemed to satisfy the rice pudding connoisseurs even if they didn’t have specific dietary needs. Rice pudding does take some patience, much like making risotto, you have to add a little bit of liquid at a time adding more as the liquid gets absorbed. This can be made ahead, and kept refrigerated. To reheat (if desired), place the pudding in an oven safe dish with a lid, and heat at 200°F with a bit extra almond milk. Rinse the rice with water. Add the rice to a large saucepan, then add the sugar, vanilla beans and scrapings, sea salt and 1 1/2 cups almond milk. Cook over low heat, stirring regularly until the milk is absorbed. Add more milk as it gets absorbed, about 3/4 cup at a time. After adding about 10 cups of milk, begin checking the pudding for doneness, the rice should be tender all the way through. Once the rice is tender, turn off the heat and stir in more almond milk until the pudding has reached your desired consistency. Serve the pudding warm, room temperature or cold. Top with a sprinkle of cinnamon and toasted sliced almonds.